Add the comfort and support of memory foam to the plushness of gel-coated fibers, and you get a cozy pillow for every sleep position. Gelled Microfiber® fill is soft like down, but eliminates allergens and odors. A layer of gel-infused memory offers a smooth, supportive surface that helps regulate temperature. Cover: 100% cotton, Filling: 90% siliconized polyester fiber, 10% polyurethane gel foam. • Plush Gelled Microfiber® fill. • Universal to all sleep positions. • Gelled Microfiber® fill with a layer of Gel Dough® memory foam. 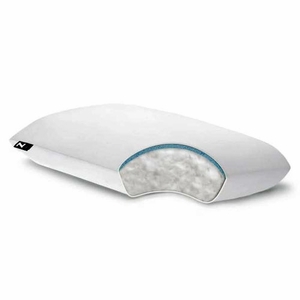 • Temperature-regulating gel memory foam layer. • Different levels of support for all sleeping positions. • The luxury of down without odors, allergens or flattening. • 250 TC pure cotton percale cover.